US Senate Candidate George Allen Exposes Tim Kaine-sian’s Economic Disaster | Virginia Right! Pessimism is creeping into every corner of our country because the path America is on today is dangerous, debilitating and unsustainable. It will diminish our children’s future and everyone’s opportunity to achieve their American Dream. Allen is absolutely correct! This is an outrage. We are robbing our children and grandchildren because Washington is too lazy and mad with power to live within our means. In the Op-Ed, the former Virginia Governor and U S Senator calls for a balanced budget amendment, caps on spending and cuts. Some say an amendment to our Constitution is an extraordinary step. Correct, and this is an extraordinary crisis that has already done great harm to the American Dream, forcing us to borrow approximately 40 cents on every dollar our government spends. A balanced budget amendment would force leaders in Washington to live by the same rules most Virginia families do — within their means. Beyond a constitutional amendment, Washington must make meaningful and significant reductions in spending and enact enforceable spending caps to prevent another increase of the debt ceiling in two years. Taken together, these three steps will finally start moving us away from the cliff and into the right direction. Make no mistake, I do not want to see our country default on its obligations, which could create hardships for everyone here both in the short term and the long term. But, we also can’t continue with the typical Washington Band-Aid approach, where they take us to the edge of disaster, offer up a short- term solution that fails to address the underlying problem, and then our country is forced to deal with the problem again down the road, spending and wasting trillions of dollars along the way. And Virginians need to be reminded of the failed administration of Virginia’s absentee governor Tim Kaine whose Tim Kaine-sian economics nearly cost Virginia dearly. But thanks to the steps George Allen is calling for – the very ones that current Governor Bob McDonnell used to dig us out of the Tim Kaine hole – America can do the same. But what does Timmy Kaine want to do? Unfortunately others don’t see it that way. Even with unemployment continuing to climb to 9.2 percent, some — like my U.S. Senate race opponent, Tim Kaine — are calling for one trillion dollars in tax increases. Tax increases will only cripple our already bleak economy by crushing any potential job growth on the horizon. This is not the first time Kaine has pushed for tax increases. As governor he called for $4 billion worth of tax increases and under his leadership Virginia lost nearly 100,000 jobs. He also shut down numerous rest areas along interstate roads throughout Virginia, claiming he needed to raise taxes to keep them open. Upon taking office Gov. Bob McDonnell launched an audit that showed the Virginia Department of Transportation actually had a surplus of nearly $900 million. 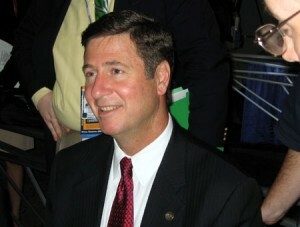 Allen is a Republican candidate from Virginia for the U.S. Senate election in 2012. Visit George Allen’s Website for more information.